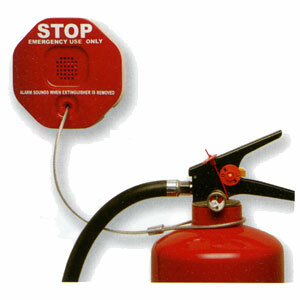 The Fire Extinguisher Anti-Theft Alarm is the perfect method to protect your fire extinguishers from theft or tampering. Effective way to stop vandalism, misuse or theft of fire extinguishers. When fire extinguisher is removed from its normal position, a piercing 120db alarm will sound. Easy to install and maintain. Comes complete with operating cable, aluminium seal, tamper key screwdriver, deactivation cable for servicing and a 9v dc power source.